We have all the latest new customer offers for you to pick from, ranging from free bets, deposit bonuses, risk free bets (sometimes known as cash back or money back specials) and enhanced odds offers. But it is also worth noting that these types of bookies promotions usually can only be used once, so it is important to see if a bookie has any kind of ongoing offers and bonuses. You need a new bookmaker to place your bets and you want to get rewarded for opening an account with that bookmaker. That is where bookierewards.com comes in, as we have the best betting offers online today. The most popular offer is the one that see’s new customers get a bonus on registering a new account with them. By far the free bet offer is used by most of our UK bookmakers, but there are many to choose from and they come in varying amounts. For instance Betway’s sign up offer is a bet £10 get £30 in free bets for those residing in the UK. Betfair started out life as an Exchange where punters would lay bets as well as place bets. But now their sportsbook section is well established as being one of the best places to bet on any sports market. Sign up to Betfair today and you can enjoy a cracking sign up offer providing you do not already hold an account with them. You can get up to a €/£100 in free bets simply by using the promo code ZBBC01 upon registering and placing the required amounts of bets. See the terms below for more details or click the link to be taken to the offer page for full t&c’s. New customers to Betfred can get £30 in free bets along with 30 free spins to use on a variety of games (can be found on the terms page) in the casino. To get this offer from Betfred just register and deposit via debit or credit card and place your first sports bet of £10 or more at odds of evens (1/1) or greater. Once your bet has been settled you will find your free bets and spins in your account usually within 48 hours. Betway are a great site to bet on the football or golf as they have ongoing promotions on a weekly basis. But for anyone wanting to sign up to them they can get a £30 free bet. All you need to do is deposit £/€10 or more and place bets to the value of your 1st deposit and Betway will match your deposit 100%. So if you have deposited £/€10 you will get the same value in free bets up to a maximum £/€30. Although fairly new to the online betting scene PWR has quickly established it self as a market leader. They offer a decent welcome offer of a matched deposit bonus up to a maximum €/£50 for UK residents. To get this signup offer click the link provided and deposit a minimum €/£10 and PWR.bet will match it. There is a 5x wagering requirement that needs to be met before any winnings can be withdrawn. Sign up to Boylesports today and you can enjoy £25 in free bets. Upon registering a new account with them and place a £10 minimum stake bet to activate your first £5 free bet. Further free bets will be released as you place more qualifying bets. Just note it will take 13 bets to get the full £25 bonus. If you sign up to Netbet today you can get a free bet up to a maximum of £50. To get this welcome bonus just click the link below register a new account and place your 1st sports bet of £10 or more and Netbet will match your 1st bet as a free bet. Just make sure that you qualifying bet is at odds of 1/2 or bigger. It seems like Corals have been around for ever, but they still live up to all the hype with their hilarious ads on the tv and excellent promotions. If you do not have an account at Coral bookmaker then you maybe interested in their new customer offer of bet £5 get £20 in free bets. The free bets are split into 4 x £5 bets which will be released once you have placed the qualifying 1st bet at odds of 1/2. If horse racing is your preferred betting medium then look no further than Racebets to place you bets with. They are a one stop betting portal for racing around the world. Sign up today using Racebets promo code WELCOME and you can get a 100% matched deposit bonus up to £50. There is 5x wagering requirement before any winnings can be withdrawn. Ladbrokes more commonly known to the racing industry as the magic sign because of their shrewd laying of bets are one of the largest online betting companies. The are offering for any new customers £20 in free bets when they place their 1st bet at odds of 1/2 or bigger. As with Coral the free bets are given as 4 x £5 bets. Just use the Ladbrokes promo code 20FREE when registering with them. If you signed up to Totesport you can enjoy not one but two bonuses. The first is a matched free bet on your 1st sports bet up to £25 (min £5). To qualify you must bet on any sports market at odds of evens or bigger. You free bet will then be accredited to your account in the next 24 hours. The second bonus comes as a cashback offer and applies to when you place a £10 bet on a Totepool betting market. Once again when this criteria has been met Totesport will give you £10 back as cash. Signing up to ComeOn is very simple but to get the £10 free bet offer you will have to opt-in during the registration process. Once you are registered you can get other promotions such as free bets on Virtual Sports every month. There is also Parlour’s Predictor which you can play each weekend. Just beat Ray Parlour’s predictions and you can get a £5 free bet or if you pick all right get £50 free bet. Get a £20 risk free bet at Paddy Power when you open a new account with them. Simply open an account using the link below and place your 1st bet on any sports event and if your bet does lose (nobody likes a loser) Paddy Power will refund your stake as cash to a maximum of £20. Certain bets only will qualify for this offer and these are Singles, doubles, trebles & accumulators only. No multiple bets will qualify. Vbet have not been around for very long but are steadily building their presence in the UK betting market. They are one of the few bookmakers that require you to place a treble or more to get their welcome offer. How does this work well sign up and deposit £5 or more and when it comes to placing your first bet you must make sure there are 3 selections or more and each one has to be at odds of 1/2 or bigger. Once your bet has been settled VBet will give you free bet tokens to the same value as your qualifying bet up to a max of £25. We all probably hold an online account with one or more bookies, but these tend to be brands that were established on the high street before venturing online. Nowadays there are more and more start up brands such as PWR.bet (our latest bookie to be added) and this is where it can pay to take advantage of the new customer offers also know as a sign up offers or welcome bonus. One of the best things to do is check out our list of new betting sites and see what betting offers they have for new customers. Terms: Bonus will expire 30 days after activating it, any winnings from the bonus money will be deducted when the bonus is removed. A minimum of £10 or currency equivalent has to be deposited to activate the bonus. You must wager the bonus money 5 times before any withdrawal can be made. This is the most popular of the sign up offers available from online bookmakers and can be a great way to try out the bookie for very little money. 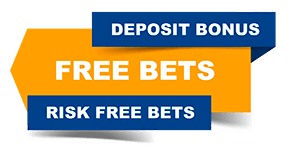 The free bet offer is exactly that, it is offered by bookies to entice you to open an account with them and it can range from £10 all the way up to £200. It will usually be offered once the account has been opened and you have deposited some funds. Some bookmakers add the free bets automatically but some do require a promo code as is the case with Betfair and their £100 Sports Bundle to activate it. There will always be terms and conditions to any bookies offer so it is wise to read them carefully before accepting any bonus. Well the easiest way is to check out our list of free bets which shows all the latest free bet offers in value of free bet, along with promo code if required and the t&c’s for said bonus. Find the one that suits your purpose, for instance if your a football lover you may be better off with an enhanced odds offer specifically designed for a particular match. But if you just want to make the most of you money and have a free bet to use on any sporting event then look down, click on the button and this will take you to the offer page and will tell you how to register an account at that bookmaker. Once you have your free bet it is worth noting that if you do win from it the free bet stake will not be included in any winning returns. This used to be a great offer as the bookie would match your first deposit, usually by 50% or 100%. So for example deposit £20 at 100% you would get another £20 added to your account to bet with. These types of bonuses tend to come with wagering requirements though as in the case of PWR.bet. They offer a 100% matched deposit bonus up to £50, so if you deposited the full £50 you would get £50 more to bet with. But you would have to bet through your bonus amount 5x. So £50 bonus x 5 = £250 would need to be bet before you can make a withdrawal. Our deposit bonuses can be found for UK bookmakers below. The risk free bet is well named and is offered by some of the bigger bookmakers such as Paddypower. When you sign up and get this type of you would place a bet and if it went on and lost the bookie would credit your account with the money back as cash or sometimes as a free bet. It is also know as Money Back Special or Cash Back depending on where you open your account. This has been a revolution in attracting new customers and can see huge odds being laid out on short priced favourites. Betfair, Coral and Ladbrokes all offer these types of offers but they are usually only to be had on specific matches or sporting events at big horse race meeting such as Cheltenham Festival. How does it work well you would visit the bookmaker by using the unique link and open an account not forgetting the promo code that will almost be required. Do not worry we will always let you know the code. Then it is a case of placing a bet usually a £1 or £5 at the enhanced odds offer. If your bet wins some places will pay as cash but most bookies will pay out as free bets. We have already stated that this is a great offer as the returns are massive compared to the stake wagered. It is not uncommon for a 50/1 odds offer to come up and you will find them all here on Bookies Rewards.